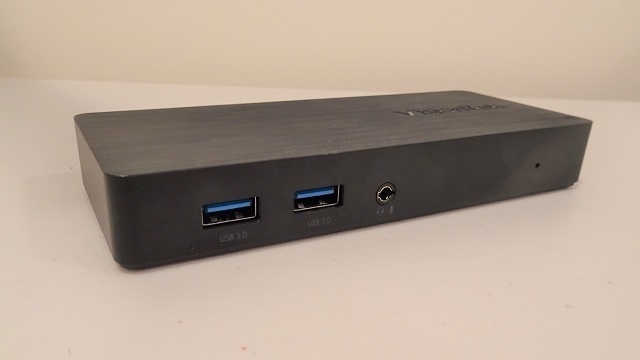 If your laptop has Thunderbolt 3 -- and you want to connect it to a keyboard, mouse, and display -- a TB3 dock is a worthwhile investment. This allows you to both charge and connect your peripherals with a single cable. Don't have Thunderbolt 3? That's OK -- you can still utilize a USB dock. While it won't charge your machine, it will still offer much convenience. While my MacBook Pro has Thunderbolt 3, my family and I have Windows and Linux notebooks that still use USB 3.0. For these computers, I have been testing a new USB 3.0 dock from VisionTek called "VT1000." Not only does it serve as a 3-port USB 3.0 hub (two Type-A on front, one on rear), but it also provides gigabit Ethernet, audio, and the ability to push two displays. For this, it offers very versatile connection options -- HDMI, DisplayPort, and VGA. The dock itself is surprisingly small -- there is no wasted space, as the rear is full of ports. Rather than use aluminum, the body is plastic. This is absolutely fine, as it is quality plastic -- it does not flex or make a creaking sound when squeezed by hand. On the right side there is a Kensington lock port, so you can secure this to a desk. The bottom features a nice rubbery material which prevents the dock from sliding. To start my testing, I decided to use a Windows 10 laptop. I plugged the dock into the wall using the included power adapter, and then connected the dock to the computer using the included USB 3.0 cable. Next, I connected a keyboard, mouse, flash drive, Ethernet cable, and a 1080p display using HDMI. Without fail, Windows detected the dock, and all of the peripherals worked! Windows display settings detected my monitor, and I was able to both extend and mirror. I added a second 1080p display using DisplayPort and it too worked flawlessly. Both monitors worked at 60Hz. VisionTek claims it can handle two monitors running at up to 2048 x 1152 at 60Hz. 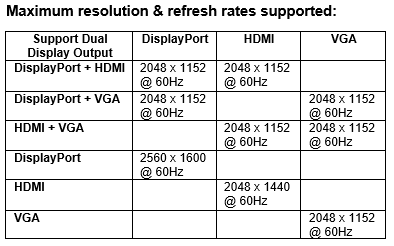 A single display using DisplayPort can hit up to 2560 x 1600 at 60Hz. You can see a chart listing all the options below. I was able to turn off the laptop's Wi-Fi and connect to the internet using Ethernet -- nice! This is particularly great because this notebook -- and many others -- no longer come with an Ethernet port. It is nice to now have that option when I need it. Quite frankly, a hardwired connection is always preferred to wireless when possible. On the front of the dock there is a 3.5mm audio jack, which Windows detects as a USB audio device. I plugged in my Audio-Technica headphones and without issue, I was able to listen to music. By the way, sound quality was wonderful. You can, of course, also plug speakers into this jack if you prefer. Also on the front is a blue light to show that the dock is connected to power. Unfortunately, the light is a bit too bright, so it can be distracting -- depending on where you place it. In my case, I had the dock directly under the monitor, and the blue light was noticeable on the bottom of my glasses. I re-positioned it out of direct view and it was fine. You can cover it with some black electrical tape if it really bothers you, but I doubt you'll need to go to that extreme. While my experience with the VT1000 on Windows 10 was an absolute dream, Linux was a different story. VisionTek does not list Linux compatibility, but I decided to try it anyway. Ubuntu 17.10 detected the USB ports, Ethernet, and audio, but I was never able to get the video to work. As a last ditch effort, I tried Ubuntu 18.04 Beta 2, but unfortunately, this did not work either. Oh well. Even without the video aspect, some Linux users may find value in having everything else perform as it should. Ultimately, for a mere $129.99 (available here), you can easily -- and elegantly -- transform your Windows laptop into a desktop. 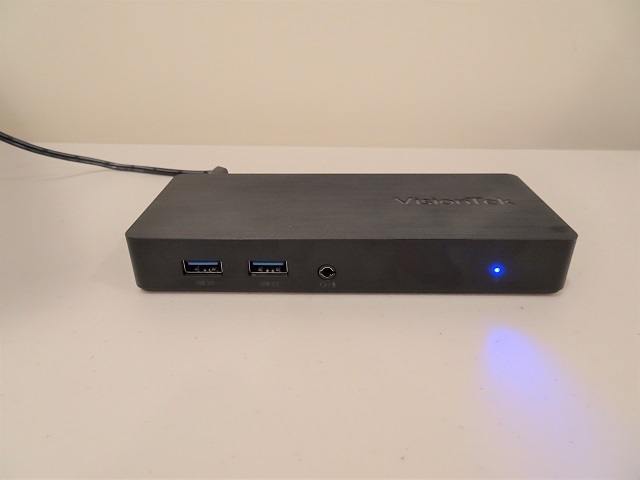 The VisionTek VT1000 Universal Dual Display USB 3.0 Dock is solidly built and performs flawlessly under Windows 10, making it a very wise purchase for users of that operating system. With the exception of an overly bright power light, it is an absolute delight to use. Users of Linux will probably want to look elsewhere, however.